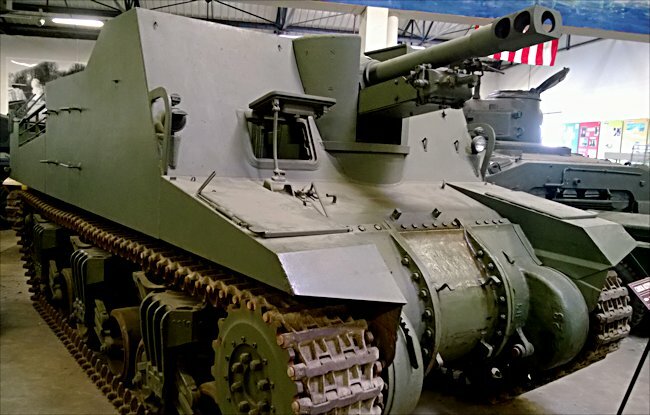 This British WW2 Sexton Self Propelled Gun SPG can be found at the French Tank Museum in Saumur in the Loire Valley. The Museum is called Musée des Blindés ou Association des Amis du Musée des Blindés, 1043, route de Fontevraud, 49400 Saumur, France www.museedesblindes.fr . The word Blindés means armoured. 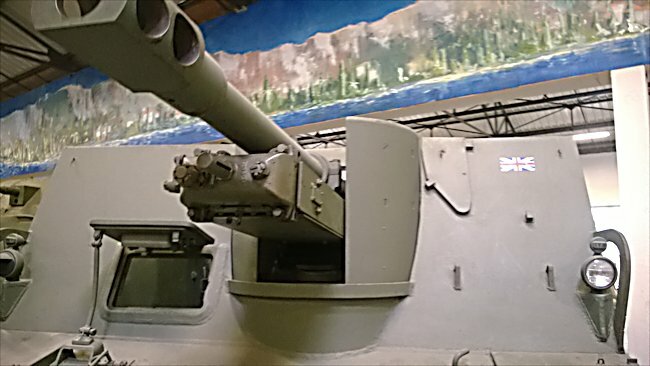 This Sexton SPG is one of the later models as it is based on the M4A1 Grizzly Sherman chassis and has an Ordnance QF 25 pounder (87.6 mm) Mk II with 105 rounds mostly HE, high explosive, carried on board. It had a 4 man crew and they were protected by 65mm of armour plating in the front. They also had use of Two 0.303 (7.7 mm) Bren light machine guns. It had a top speed of 40 km/h (25mph). On the left hand side of the Sexton there is a hatch in the side armour just above the tracks. It is at the height of a mans chest. It was used for loading shells. It saved having to haul shells over the side of the hull armour. A crew member just had to pick them up from the ground and slide them through the hatch into the hands of another member of the crew who would put the new round into the ammo store. Side view of a British Sexton II Self Propelled Gun SPG. You can see the ammo loading hatch with a handle welded onto it on the side of the Sexton. In old black and white newsreel movie footage of a Sexton barrage it showed that the troops rigged up a canvas covering on poles going over the top of the open crew and gun compartment. I do not think this was for protection from the rain in this incident. The sun was blazing so the crew used the canvas to obtain some shade as they worked on the 25 pounder gun. On the right hand side of the Sexton SPG in the middle of the hull armour you will see four handles. These were to help the Sexton crew mount the vehicle. Then put their foot on top of the middle bogie wheel unit and pulled themselves up. They then used the bottom rung of handles as steps to enable them to get their leg over the side. Only two pairs of handles were fitted to the left side. British Sexton II Self Propelled Gun SPG had thin frontal armour. For personal protection some sextons on active service had two machine guns mounted on the top of the hull. One at the front and another at the back of the crew compartment. The machine guns used were .303 (7.7mm) Bren Light machine guns that could hold between 50 and 30 rounds the magazine that could hold fifty 30 round magazines. The power plant was a continental R– 9759 cylinder radial petrol engine that produced 400hp. It has a top speed of 25 mph. Roughly 40 km per and an operational range of 125 miles (200km) for refueling was required. It was made in Canada at the Montréal locomotive works between 1943 and 1945. Around 2000 were made. It was in operational service between 1943 and 1956, with the armies of Canada, Britain, South Africa, Poland and Portugal. There were three versions made. 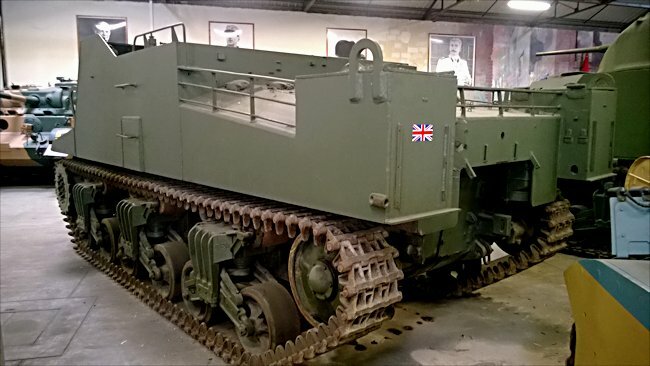 The Sexton Mark one use the ran tank hull: 125 of these vehicles were manufactured. The Sexton Mark II was based on the Sherman M4A1 tank hull. The Sexton GPO (gun position officer) did not have a gun fitted. The extra free space was used to install a number 19 wireless and fit map tables. The unit's commanding officer use this vehicle to control battery fire. Rear view of the engine hatch covers on a British Sexton II self Propelled Gun SPG. They were big and could be removed to maintain the engine easier. Where can I find other preserved Sexton SPGs?